Saunter through the shaded corridor between Palo Alto High School’s library and English building on any given weekday morning and, among the fervent footsteps of underclassmen rushing to class and the indistinct conversation of laid-back seniors still lingering nearby, you will spot Paly’s newest English teacher, Alanna Williamson. She stands outside her classroom wearing a bright smile and humming Broadway tunes to herself as she greets each of her American Literature students. Williamson didn’t always want to be a teacher. In fact, she grew up with dreams of performing on Broadway. She participated in competitive dance from age three to 18 and was an avid participant in Fremont High School’s theater program. Williamson’s aspirations of performing on Broadway blossomed when she found a home in her school’s theater program. Williamson says her teaching reflects her experiences pursuing theater and dance. She believes it has developed her people skills and helped her become more confident. The classroom is Williamson’s new stage, and she owns it. This year, Williamson’s class schedule includes two courses: American Literature 11 and English 10. According to Williamson, her 10th grade class will integrate a social justice theme throughout the year. As for her American Literature class, Williamson’s 11th grade students will connect ideas from literature to the American dream. Williamson feels as though things are running smoothly. 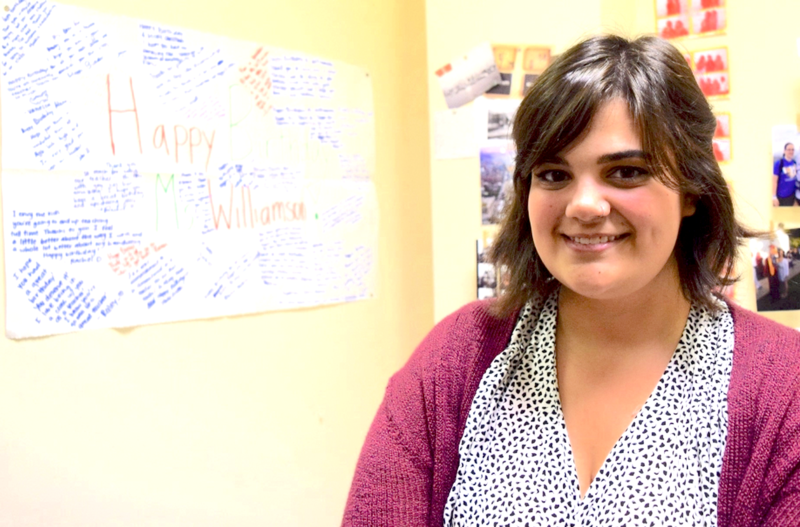 Williamson aims to create close bonds with her students, so that everyone in class feels comfortable, including herself. “When I’m standing in front of my students in class, I’m not afraid to be myself,” Williamson says. She also enjoys keep her students engaged and interested. “When there are those times we need to be silly, that’s fun for me to do,” Williamson says. Williamson loves teaching and always has fun with her students, but it’s possible she would not have considered the profession if it weren’t for an inner ear injury that caused her to acquire a disorder called vertigo at age 19. This condition means she cannot spin her body around without feeling nauseous. Given that dancing and movement had been an integral part of Williamson’s life, her plans for the future suffered a crushing blow. The career on Broadway that had previously dwelled on Williamson’s horizon became impossible. Williamson still misses her ability to dance now, almost five years after first being diagnosed with vertigo. Though she is not pursuing a career in dance or theater anymore, Williamson still likes to watch performances. After seeing her first Broadway show, “Hedwig and the Angry Itch,” Williamson felt deeply touched. Despite this shift in her dreams, Williamson still finds ways to stay active and do what she loves. She mimics what she loves about dance to the best of her ability. Williamson’s hobbies include yoga and spin class at SoulCycle, an exercise bicycle-based fitness center. The workouts involve simultaneous upper body choreography and pedaling. Now that Williamson is fairly well-established at Paly, she has found her way back to involvement with dance and theatre. “The dance coach and the theatre teacher have been really kind and let me help out with practice,” Williamson says. Williamson is also involved with other activities at Paly, including advising the Improv Club. She enjoys connecting with her students and making sure their learning process goes as smoothly as possible.